One of Mattel's latest toys will elevate tweeting to a level of uselessness not seen before. 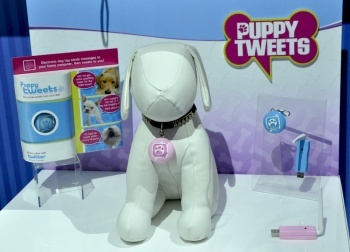 A new toy developed by Mattel called "Puppy Tweets" is designed to relate a dog's daily experiences on Twitter. Simply sign the dog up for a Twitter account with a clever name of some sort (bonus points for "bark" or "arf" in the name) and place the device around the dog's neck. It comes in pink or blue for a very reasonable $30. Puppy Tweets works by fusing directly to your pet's brain through a painful surgical procedure and cannot be removed once attached without killing the animal. Just kidding: it uses a variety of motion and sound sensors. If it were to detect, say, lots of annoying barking, it would tweet something clever like "Barking is the spice of life," or something similarly cringe-worthy. The Puppy Tweets collar sends a wireless signal to a USB adapter that must be plugged into a computer whose power lever is pulled into the "on" position. The device comes loaded with over 500 different tweets it can annoy the internet with, and even more are planned as DLC. The tweets will likely cover acts such as defecation, urination, playing in the snow, licking parts of an animal's own reproductive system, drinking water, licking parts of another animal's reproductive system, taking a nap, eating feces, running, and eventually death. Sorry, but everything dies, even if it's wearing Puppy Tweets. Happy Valentine's Day.